Japan Short Takes is a series I’m doing now which features single photos from my massive on-going project on Japan, which has expanded from the streets to Tokyo to streets, cityscapes and landscapes of the cities of Osaka, Hiroshima, Kyoto and many more. I went to Japan again during this past spring, my 5th photography trip since my solo trip marking the start of Tokyo Dreaming in April of 2012, and my 7th trip overall to the land of the rising sun. Because of the sheer number of pictures, and the deviation from the original theme of Tokyo Dreaming, Japan Short Takes will allow me to show pictures from the trip and feature different facets of Japan using individual single pictures. I’m also, for the first time since I started this blog, offering print sales of pictures from Short Takes of up to 24″ x 36″ in size, matted and framed. For pricing, please email me for more information. 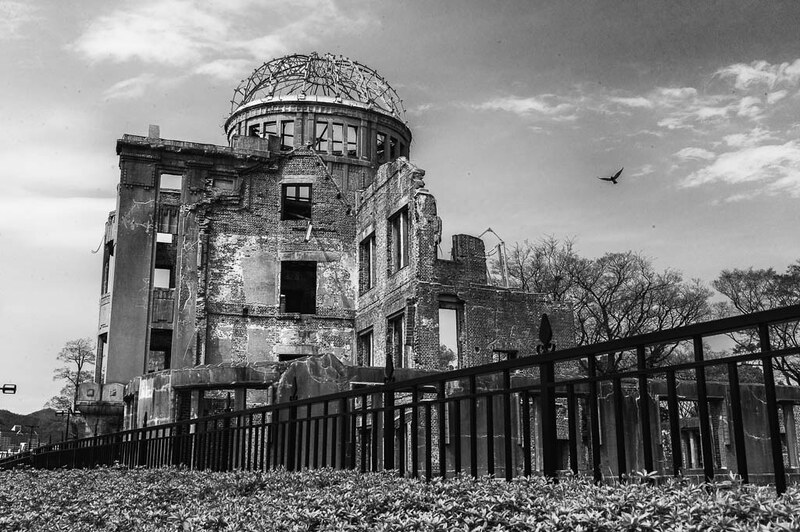 Today’s feature is the Hiroshima Peace Dome, the still standing relic and reminder of the horrors of the atomic bombing of Hiroshima during World War II. At 8:15am, August 6th, 1945, an American B29 bomber carried out the world’s first atomic bombing. The bomb exploded approximately 609 meters above and 160 meters southeast of the Hiroshima Prefectural Industrial Promotion Hall, ripping through and igniting the building, killing everyone in it. Because the blast struck from almost directly above, some of the centre walls remained standing, leaving enough of the building and iron frame recognizable as a dome. This building was renamed the A-bomb Dome after the wall. The Atomic Bomb Dome or Genbaku Dōmu (原爆ドーム?, A-Bomb Dome), in Hiroshima, Japan, is now part of the Hiroshima Peace Memorial Park and was designated a UNESCO World Heritage Site in 1996. The ruin serves as a memorial to the people who were killed in the atomic bombing of Hiroshima, where over 70,000 people were killed instantly, and another 70,000 suffered fatal injuries from the radiation. For more on Japan and Tokyo Dreaming, check out the rest of my work on this blog!